I recently posted a story about environmental canvassing that could be defined as "constructive criticism." To sum it up I didn't like the hard sell method of street canvassing and advocated for a softer sell approach. Well, the group Environment California took notice and posted my business card on their bulletin board with a sign that said "must read" with a frown face. I still stand by my position, but another morning trip to my neighborhood Starbucks today gave me a more positive perspective on the work they are doing. I again observed the tactics of the canvassers outside of the shop and then talked to a very friendly young woman who is one of the org's directors. She gave me a different and more positive view of the organization. She informed me that the canvassers that day were probably under pressure to fill their quota so they were more aggressive in getting people to sign up for a monthly paid membership. She said that normally they give the option of becoming a grassroots member for free and that the most important thing is informing people about the latest campaign and about environmental issues in general. This approach will turn more people on to green causes in my view. I want nothing more than to see organizations like Environment California and Greenpeace succeed beyond their wildest expectations and to make tons of money to support their campaigns and also to receive more positive attention from the media and the average person. That said, here is a little info about their latest campaign to ban plastic bags and Styrofoam cups and containers. The campaign is dubbed the "Great Pacific Cleanup." The State Assembly passed their bill to ban plastic shopping bags on June 2 and they are now working to build support in the Senate. Click here for more information about their efforts. 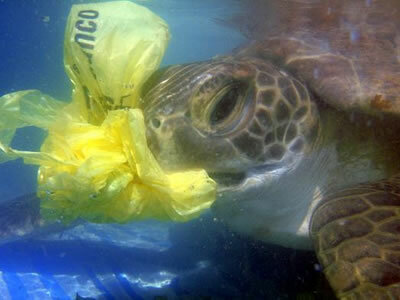 Some facts: Plastic and other marine trash kill more than 1 million seabirds and 100,000 mammals and sea turtles each year. The amount of plastic in the ocean has tripled since the 1980s. This is a very important campaign and I urge you to get involved in whatever way you can.